First impressions are everything and when it comes to decorating your interior, the hallway is the first glimpse that friends and family will have of your home. Before they see that dream kitchen or stunning open-plan living space, the hallway is access all areas, so make sure it sets the right tone and gives visitors the perfect welcome. We often pay a lot more attention to all the other rooms of the house and tend to neglect this area, making do with a fresh coat of paint and perhaps some new carpet for the stairs if we have the time and budget. 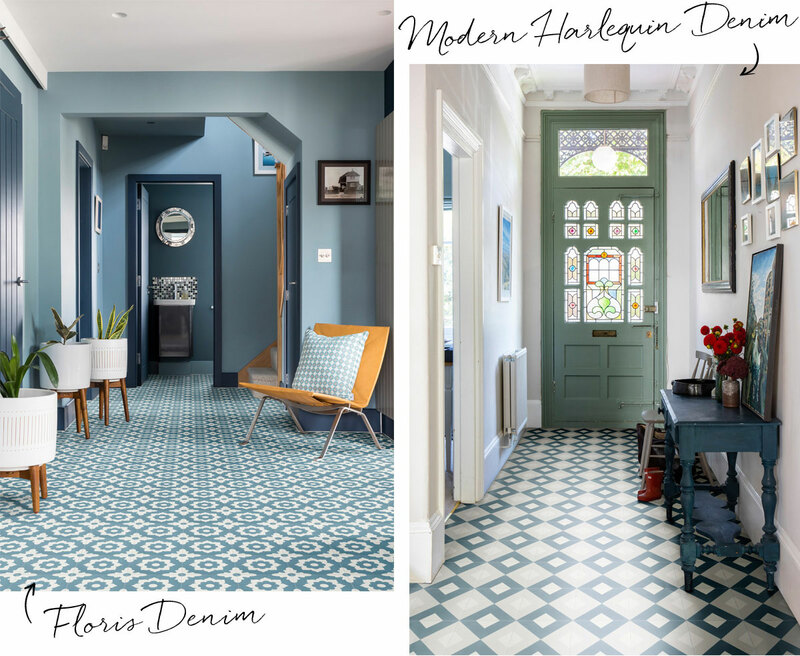 But we think that your hallway deserves extra care and attention with a bold flooring choice that offers instant wow factor the minute you step through the front door. Think about introducing pops of colour to an otherwise neutral setting with toned-down walls and stairs, which can be offset wonderfully with a colourful or printed tile. 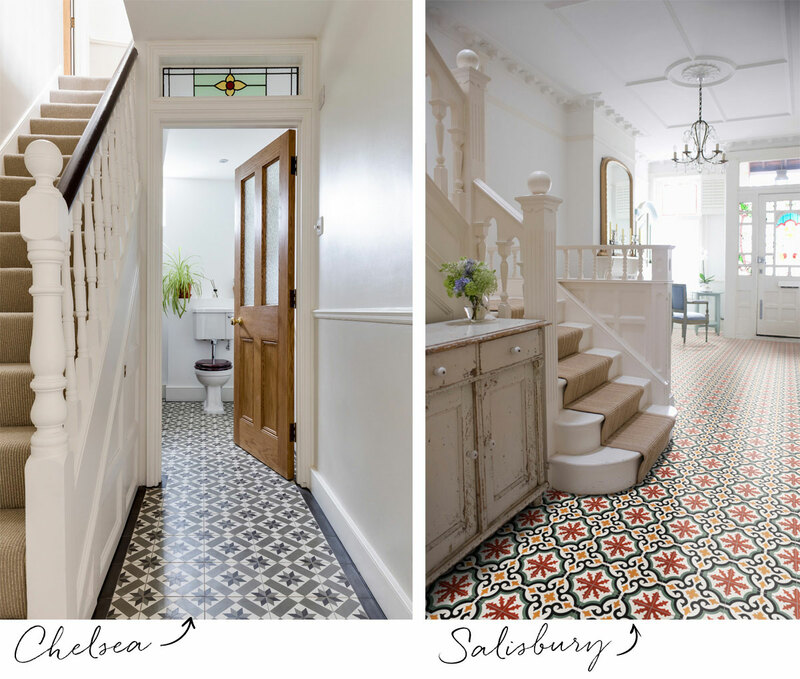 Smaller tiles can be intricate and detailed, giving hallways instant impact while a patterned design draws the eye downwards and becomes an immediate focal point, giving the hallway an on-trend finish without having to splash out on expensive wallcoverings, lighting or furniture to complement. Another great thing about Ca’ Pietra encaustic, porcelain and terrazzo tiles is that they are incredibly hardwearing, making them an ideal choice for this high-traffic zone. For continuity and to elongate the space, consider installing the same tiles in a downstairs cloakroom. This neat little design trick is great for creating a feeling of space within a smaller area such as the traditional Victorian terrace. You could even go so far as to carry the flooring through to the kitchen and utility room too, for a seamless look throughout. 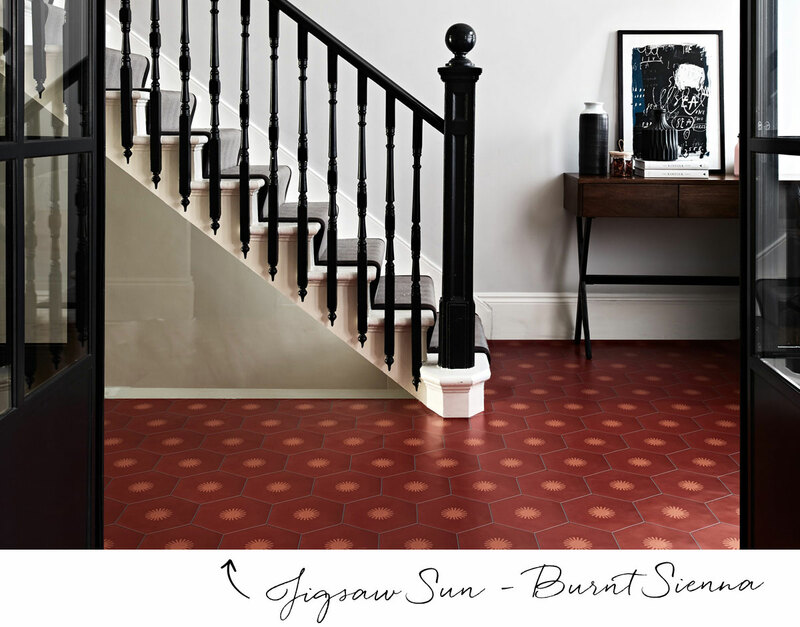 We love the finish of the Jigsaw Sun Pattern Tile by Neisha Crosland, which looks striking when used expansively throughout the downstairs area. In Burnt Sienna, Duck Grey, Pebble Grey, Pistachio or Sludge Grey, it can be eye-catching or natural, depending on the feel you wish to create. The surface finish is also an important factor. Go for honed for a matt look; polished for something contemporary and modern; tumbled, distressed or worn for a rustic effect or encaustic which can work in both contemporary and timeless traditional homes perfectly. Finish the area with a smart set of hanging hooks or peg rail for coats and bags and a shoe store or seating bench with integrated storage. Add a leafy potted plant or two and you have the ultimate entrance hallway for a truly welcome home.